You’ve got to be lucky to see the shy black-flanked rock-wallaby, a small and extremely agile marsupial that darts among rocky outcrops and caves in central and western Australia. It emerges only at dusk to feed on grass, leaves, bark and fruits. But it’s a spectacle to behold on warm wintry days, when this gorgeous animal is sometimes glimpsed soaking up the sun's rays. It's this preference for rocky refuges that has been the key to the wallaby's survival. Much of its surrounding landscape has been cleared for farming, and the rocks have afforded some protection from the foxes and cats that have decimated other Australian mammal populations. Although this rock-wallaby is still quite widespread across its range, habitat destruction, predation by foxes and feral cats, and competition for food and shelter have exacted a terrible toll. Scientists report many local extinctions and the wallaby's distribution is now greatly reduced. The populations that remain are generally small, isolated and at risk of extinction. 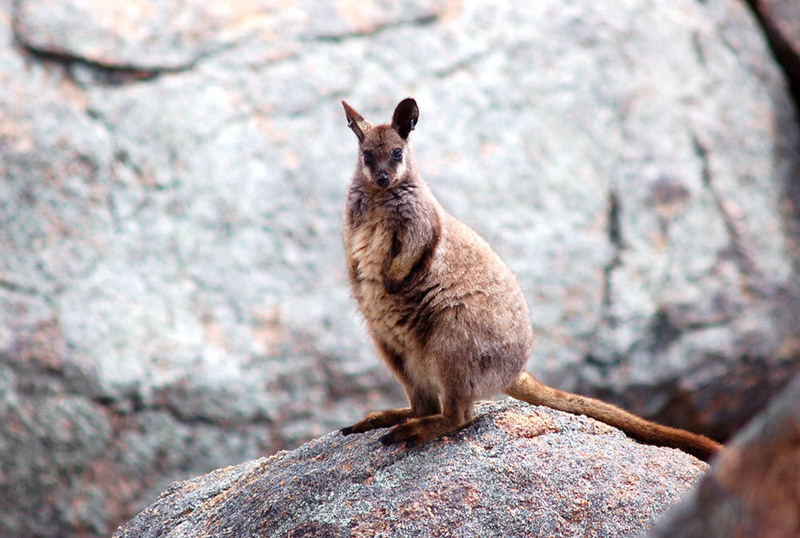 View our projects involving the black-flanked rock-wallaby. Few have heard of it and even fewer have seen it, but the wiliji is very much on WWF's radar. Since 2011 we've been working with Nyikina Mangala Rangers to give the wiliji every chance of survival in the Grant, Edgar and Erskine ranges. Nangeen Hill's population of black-flanked rock-wallabies plummeted in 2010 and a Class A nature reserve was declared in the Western Australian Wheatbelt. WWF supporters and the Western Australian Government partnered to fund a five kilometre predator-proof fence in 2013 that now keeps the resident rock-wallabies safe from foxes and feral cats. Kalbarri National Park once supported a healthy population of black-flanked rock-wallabies but they virtually disappeared due to predation by foxes and feral cats, habitat degradation and competition from feral goats. WWF has helped to bring the wallabies back to the park. Textured pads on its hind feet, which act much like the sole of a running shoe, enable the black-flanked rock-wallaby to bound around its rocky home. It moves swiftly and confidently, its dark fur perfectly camouflaged with its surroundings. Rock-wallabies shelter during the hottest part of the day in caves and among cliffs to avoid water loss, then emerge in the early evening to graze on grass and herbs. They live in colonies, and although they rarely make a sound, scientists believe that members communicate using a complex array of behaviours and chemical signals. There’s still a lot we don't know about the wary black-flanked rock-wallaby, but we do know that its numbers are declining and that we need to act fast. While there's clearly no place like home, moving wallabies to areas of suitable habitat and keeping out predators has proven effective. Listed as Vulnerable (EPBC Act 1999) and Near Threatened (IUCN Red List). 3. Petrogale Iateralis pearsoni (Pearson island rock-wallaby), found on islands off South Australia. 2. Petrogale Iateralis west Kimberley race, known from the Grant, Edgar and Erskine ranges in the west Kimberley (also known as wiliji by Traditional Owners of this region). The soles of its hind feet are coarse, acting much like the sole of a running shoe, providing friction and grip as the rock-wallaby bounces around the rocks at high speed. This species is known by many names in English and traditional Indigenous Australian languages, including: warru (or waru), black-flanked rock-wallaby, black-footed rock-wallaby, side-striped rock-wallaby, bokal, moororong, kakuya , lungkarrpa, pakultarra, rukapiki, tanpa, tjinangalku, tjirti, wartilara, wokartji, arrwe or kavtetve. The Latin name, Petrogale lateralis, means ‘notable-sided rock-weasel’– although these sweet animals look nothing like a weasel, and are not even distantly related to them. Although still found across central and south-western Australia, the black-flanked rock-wallaby has faced mounting pressures. Predation by foxes and feral cats, habitat destruction, and growing competition for food and shelter have caused many local extinctions and the rock-wallaby's distribution is now greatly reduced. Remaining populations are generally small, isolated and at risk of extinction. You can donate to our current appeal to support WWF's conservation efforts. If you prefer getting your hands dirty, then volunteer to help monitor rock-wallabies by counting scats (poo), an activity scheduled every two months or you could join us in planting food plants to sustain these shy animals. 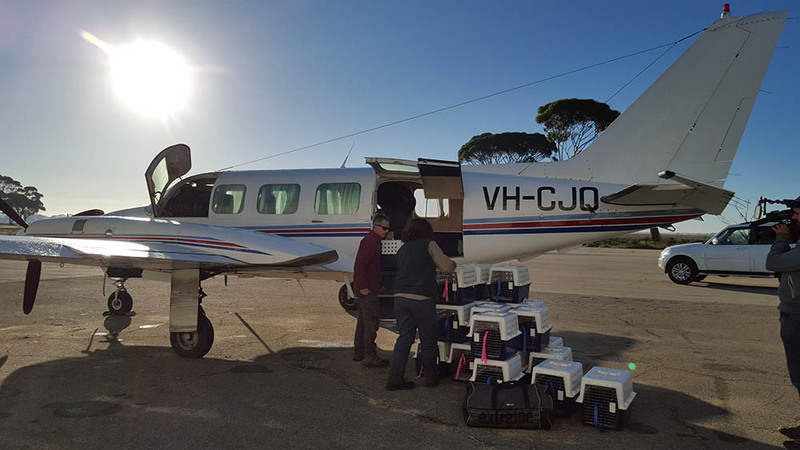 An aerial translocation of black-flanked rock-wallabies to Kalbarri National Park has replenished its dwindling population. A population of black-flanked rock-wallabies at Nangeen Hill is flourishing, thanks to a predator-proof fence and revegetation organised by WWF.